BE SURE TO READ THE WHOLE POST...down to the very last word. I've kept the secret....our secret. It's shocking. The mind, the hands, the genius behind Tallgrass Prairie Studio is my 21 year old son, Jonathan. 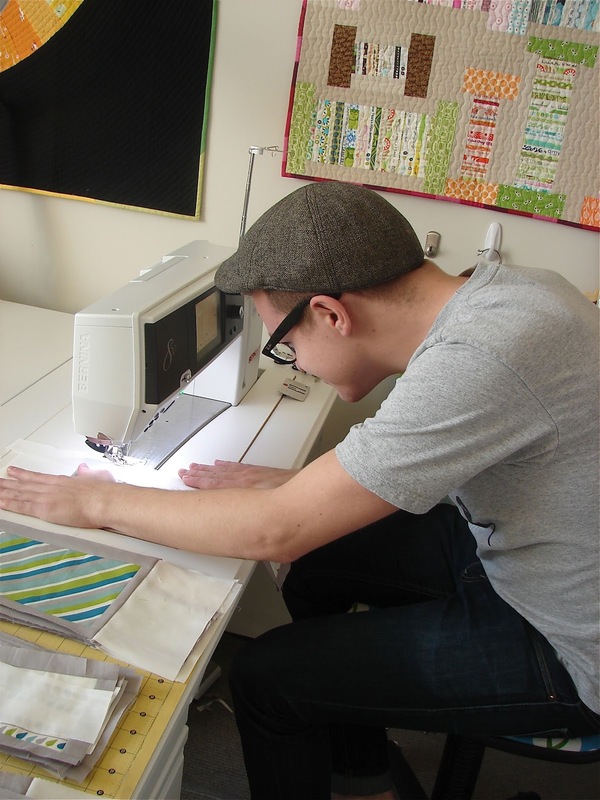 He designs, sews and creates the quilts and I take the credit. He's a creative savant...sketching, designing and creating. He can design, piece and quilt a quilt in a day. He's amazing. He sews so fast I could barely get a picture of him. He's a cross between Denyse Schmidt, Christian Siriano and Craig Ferguson all rolled into one quilty guy package. If you look at the picture closely you'll see he is about to BURST out laughing (and possibly die of embarrassment). Now, do I have a witty, fun, and willing son with a GREAT sense of humor? Enjoy your April Fool's Day! PS Did we fool you....even for a few seconds? I am an April fool! Are you playing a prank today? holy crap. that was a GOOD ONE! I was like, "no way! she's like milli vanilli! and all those lipsynch-ers!" hehe Oh you got me. SHEESH! Only half an hour ago I was thinking that I must remember it's April Fools Day! Did I remember? NOPE!! Ha...yes good one. When I got to the photo I did think 'that sitting angle doesn't look so comfortable'but still didnt guess! Thanks for a great laugh! I was thinking no way, is this true?? You drew me right in....!!! You got me. I love that your son has a sense of humor. It will be a blessing when life gets rough. Bahahah. Cute. I love April Fools day! Nope, didn't fool me either. His sewing position and the part about doing it all in one day...too overboard to be believeable. Back to the Fool's drawing board for you! LOL Better luck next year. teehee ~ tho it could be believable! there are people who do whole quilts in one day (I know a few). Too funny! I WAS surprised at the start... You inspired me to pull one myself on my own blog. Have a great day! Really funny. Not believable, but funny. First time to visit your blog. Not even sure how I ended up here but coming back for sure. Really creative and funny. Love it. By 0620 this was my second April Fools prank of the day. Didn't fool me... but! I think he may have a few more stitches in his future! I sure wish I could find someone to do all my work and take the credit! How cool would that be, really??? You almost had me until you mentioned Craig Ferguson! Then I KNEW what kind of humor you lean towards. I love it! You had me going for a minute....until the speed sewing part. You are TOO much! What a handsome son you have there, and what a good sport. Fun! My prank: yarn-bombing my lab. Muhuauaahahahaha! Ha ha, that was a good one. Now tell him he really needs to make a quilt! Awesome! You really got me, girl! But you gave me mt morning dose of laughter! You sure have a great son! OMG, that was a good one. I tried to pull one on my 18 yr old but couldn't stop laughing. Yours was great. Hysterical! you can tell he was laughing! What a great sport! You got me! Very funny indeed! Oh, you totally had me! I must admit I'm disappointed that he isn't a quilting marvel!